Welcome to the Roman Southwell community project. We are a friendly, community archaeology group with an interest in our local heritage. Our aim is to explore the Roman settlement of Southwell and the surrounding region, through active research, landscape studies, practical fieldwork and community events. ALL our work is funded via fundraising events and public donations – without your support we cannot operate. You can fund our work by donating to the project via our Support Roman Southwell initiative. For more information, visit the About tab, and sign up to follow us! NOVEMBER 2018 – Roman Southwell awarded a further two years of funds from The Nineveh Trust! SEPTEMBER 2018 – Bookings for 2019 Excavation Season now open! We are very pleased to announce that The Nineveh Trust have awarded us two more years of funds to help support our Landscape Research. We were initially awarded three years of funds back in 2015 to cover the period 2015-2017, which allowed us to undertake landscape studies on the Roman road network and explore Gold Hills Farm adjacent to the vexillation fort at Osmanthorpe, as well as funding reports and public events. This additional funding will cover the period 2019-2020 and will allow us to more fully explore our new site at Newfields Farm, Hockerton as well as finish off our work on the potential hillfort at Southwell. Work on this element of the project will now resume in the New Year. 2019 Season – Bookings now open! After having the pottery from Seasons 1-3 analysed earlier this year, we have now decided to undertake a fourth and final season of excavations, planned for the summer of 2019. Analysis of the pottery from Farthingate revealed that all the pot dates to the 1st & 2nd centuries, thus predating the later phase of the villa by some 100-150 years. This suggests, given the width of the river separating the villa from Farthingate, that the material recovered from No. 26 Farthingate relates to a separate settlement that co-existed with the very early phase of the villa site. This is pretty exciting as it means the early Roman occupation at Southwell is larger than previously envisaged! Plans for 2019 are to further explore the Farthingate area alongside Farthingate Close and Wakeling Close, to try and ascertain how far the settlement may have spread. Finds from the 2017 season included pottery – sherds of Samian, mortaria, grey ware, black burnished ware and colour coat – both floor and roof tile, and a stone loom weight. Roman artefacts were recovered from several sites along Farthingate, sites covering a span of around 150m, but the main concentration occurred just behind the area where in 2016 & 2017 we excavated a wide ditch-feature that seems to have been built as a flood defence. As always, the community dig is open to members of the public and students and will be run as a training excavation / field school, with placements being subsidised by the project to keep costs as low as possible. Training and support will be given to Archaeology Skills Passport standards, and will cover trench layout, excavation, recording, planning, section drawing, dumpy level surveys, photography and understanding stratigraphy. There will also be extra activities including evening lecture, guided walk and end of week social night each week. Places are limited to five placements per week. Cost is £150 per week or £225 for two weeks. The project has been shortlisted for an Aviva Community Fund award, but we need public votes to help us secure the grant! Please click here to vote, and to hear more about our proposals. The report details the summer excavations on Harvey’s Field and Farthingate. Roman Southwell shortlisted for Tesco funding! The Roman Southwell Community Project has been shortlisted for a Tesco ‘Bags Of Help’ funding award. Customers in Tesco stores can vote for their preferred project from one of three choices between 2nd – 28th January 2017. The project with the most votes will receive £5000, second-most votes £2000 and least amount of votes £1000. Whatever amount we are awarded, the funds will contribute towards our Summer 2017 Community Dig. Involve Heritage CIC is bidding to bag a massive cash boost from the Tesco Bags of Help initiative. Involve Heritage CIC is one of the groups on the shortlist. The Roman Southwell Community Project seeks to explore the history and archaeology of the Roman landscape at Southwell, Nottinghamshire and the surrounding region. It involves local people working together to undertake fieldwork and documentary research, public events, school activities, fundraising events and a series of talks, walks and publications. Each summer, it hosts a Community Dig, where students and members of the public can be trained and supported in undertaking an archaeological dig. The project is a joint-venture between Involve Heritage CIC and Community Archaeology specialists MBArchaeology. The project is entirely self-funded through small grants, business sponsorship, public support & donations and a series of fundraising events. It is now in its fourth year. Project Director Matt Beresford said “ we are delighted to have been chosen for a Tesco ‘Bags of Help’ funding award. 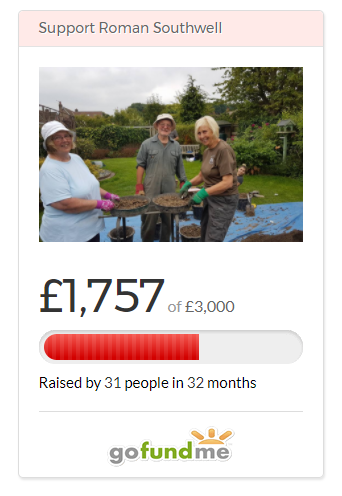 The funds will go towards out summer dig in 2017 and allow us to undertake further community excavations on our site in Southwell. It will mean we can once again subsidise a number of Community Placements for students and members of the public to get involved and be trained up to Archaeology Skills Passport standards. Please help us secure as much funding as possible by voting in one of our local Tesco stores’. Voting is open in stores from 2 January to 28 January. Customers will cast their vote using a token given to them at the check-out in store each time they shop. 2017 Dig – booking now! We are now taking bookings for our Summer 2017 Training Dig! This year, we found further undisturbed Roman deposits and revealed more information on our Harvey’s Field & Farthingate sites. These included a large ditch identified in 2015 via a geophysical survey which appears to have served as a flood defence for the top end of Farthingate, where we discovered Roman building debris and pottery. Plans for 2017 include further exploration of the ditch, the rubble deposit and further target areas along Farthingate as we try and understand more about the Roman landscape at Southwell. No experience is necessary, and full training and support will be provided. Those attending will be trained in fieldwork techniques such as excavation, finds identification, recording, planning, section drawing and height level surveying, and training is geared towards the Archaeology Skills Passports. Places are limited, and are offered on a first-come, first-served basis. Placements run Mon-Sat each week, and cost £150 per week, or £200 for a fortnight (two consecutive weeks). Each placement week also has extra activities, including a walking tour of the town, a talk on the project’s discoveries over the last 3 seasons, and a social evening get together. Click image below to Donate / Join Up!